Nancy and her pals set out to solve a mystery, make new friends, and establish their place in the community. When 2019 wraps up, I suspect Nancy Drew and the Hidden Staircase will win the “prize” as the most perplexing major studio release. The film hit screens on March 15, but apparently it ran almost entirely at AMC theaters and eschewed the other major chains. In addition, Warner Brothers wasted no time with the announcement of a home video release. 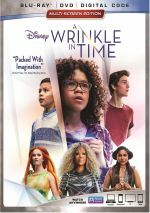 The Blu-ray made it to shelves on April 2, 2019, a mere 18 days after the flick got to theaters. In my 20 years as a review monkey, I’ve never seen anything like that. Because I mainly frequent AMC theaters, I viewed plenty of trailers for Staircase and assumed it’d get a mass issue, so its odd theatrical release surprised me, as did WB’s decision to shovel it onto video so quickly. Normally one would assume WB figured they had a dog on their hands and wanted to dispose of it without haste. Perversely, the strange release schedule made me more interested to watch this update on the classic literary character. After his wife dies, Carson Drew (Sam Trammell) and his teen daughter Nancy (Sophia Lillis) move from Chicago to a small town called River Heights. This change doesn’t sit well with the adventure-seeking Nancy, as sleepy River Heights bores her. However, Nancy finds excitement when she investigates the mystery of a supposedly haunted mansion. This leads her down various paths as the youthful detective attempts to solve the case. As a kid in the 1970s, I never read any Nancy Drew books, which you could possibly chalk up to sexism, as boys rarely took to those titles. However, I also avoided the male-centric Hardy Boys novels, so let’s just assume the subject matter didn’t interest me. I mention this solely to establish that I enter Staircase with no bias against the 2019 film. Lots of us old fogies protest “updates” like this because they don’t slavishly replicate the (dated) source, but the ways in which the movie brings Nancy into the 21st century don’t offend me in the slightest. No childhood raped here! Does this mean I liked Staircase, though? Oh my, no! Silly and one-dimensional, the movie lacks much merit. And by “much merit”, I mean I can’t think of anything in particular to praise here. In other projects, Lillis showed talent, and she became one of the highlights of 2017’s horror hit It. Here, unfortunately, Lillis just seems obnoxious. She tends to overplay the character’s forced spunkiness and seems more smug and arrogant than intelligent and insightful. None of the other actors pick up the slack. As one who remembers Linda Lavin from the Alice TV series in the 1970s, it’s nice to see her here, but otherwise, the actors just overplay their parts and irritate more than they endear. Not that anyone expects airtight plotting from a Nancy Drew movie, but the story seems borderline incoherent. The plot comes across as so hokey and ham-fisted that Scooby-Doo would reject it, and it brings no thrills, chills or intrigue. Obviously, I recognize that 51—year-old men don’t act as the target audience for a Nancy Drew film, but that doesn’t mean we need to accept a poorly-made movie. More a collection of slogans, silliness and dangling plot points, the flick flops. Casting curiosity: as Nancy’s “frenemy” Helen, we find Laura Wiggins, an actor who hit 30 in 2018. She’s a very attractive woman, but she doesn’t look remotely age-appropriate to play 16 – unless most high school juniors sport forehead wrinkles and crow’s feet. Who thought a 30-year-old made sense as a mid-teen? At least the producers of Grease surrounded its “elderly” actors with others too old for the parts, but since Staircase pairs Wiggins actual 16-year-old Lillis, she stands out. Nancy Drew and the Hidden Staircase appears in an aspect ratio of approximately 1.78:1 on this Blu-ray Disc. This was a pleasing visual presentation. From start to finish, sharpness looked very nice. Only a bit of softness affected wide shots, and those examples didn’t dominate. Instead, the film looked largely concise and well-defined. Blacks were dark and deep, while shadows appeared clear and smooth. I thought the movie consistently looked solid. I felt that the DTS-HD MA 5.1 soundtrack of Staircase seemed fine but it didn’t excel because of a lack of ambition. The movie featured a limited soundfield that favored the forward channels. It showed nice stereo spread to the music as well as some general ambience from the sides. Only minor extras appear, and A Sleuth, A Girl and An Inspiration runs a eight minutes, 58 seconds. It provides notes from producer Jeff Kleeman, director Katt Shea, and actors Sophia Lillis, Zoe Renee, Linda Lavin, Mackenzie Graham, Sam Trammell, Jay DeVon Johnson and Laura Wiggins. “Sleuth” looks at the Drew novel series and its impact as well as characters and themes. It basically tells us how important the books and movie are, so expect little real content. Pink Footprints lasts four minutes, 44 seconds and features Lavin, Lillis, Kleeman, and production designer John Collins. We visit the movie’s “haunted” set on this short but reasonably effective show. A Gag Reel goes for three minutes, 13 seconds. It mostly provides the usual goofs and giggles, but a few decent shots of the set appear as well. The disc opens with ads for Alex & Me and Lego Movie 2. No trailer for Staircase appears here. A second disc presents a DVD copy of Staircase. It includes the same extras as the Blu-ray. 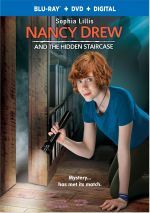 Anyone who hopes that Nancy Drew and the Hidden Staircase will revive the franchise will encounter only disappointment. Utterly devoid of fun, thrills or charm, the movie falls short in many ways. The Blu-ray brings very good picture and audio as well as a handful of minor supplements. Even undiscerning pre-teens can do better than this nonsense.